For this winter I want to do the complete interior. I have no experience with interiors but I going for it. 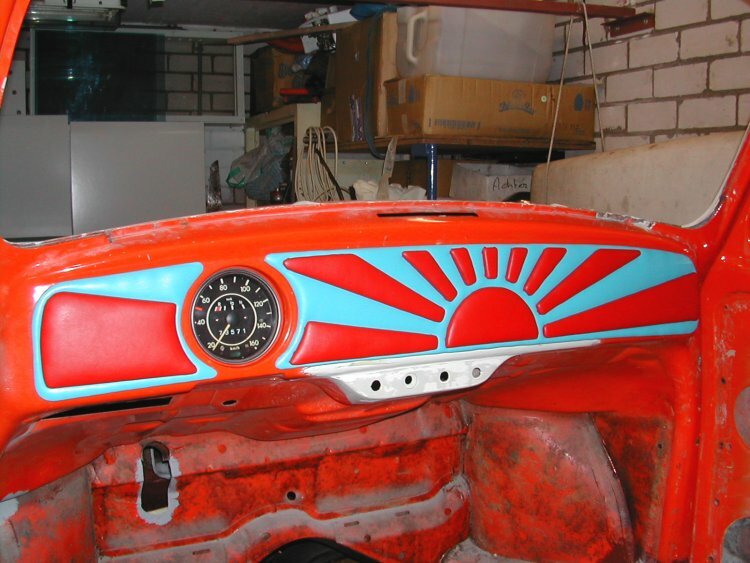 The plans are: 2 door panels, 2 rear panels, 2 dashboard panels. I going to mount just one seat in the back. And on both side of the rear seat there will be big speakers and amps. 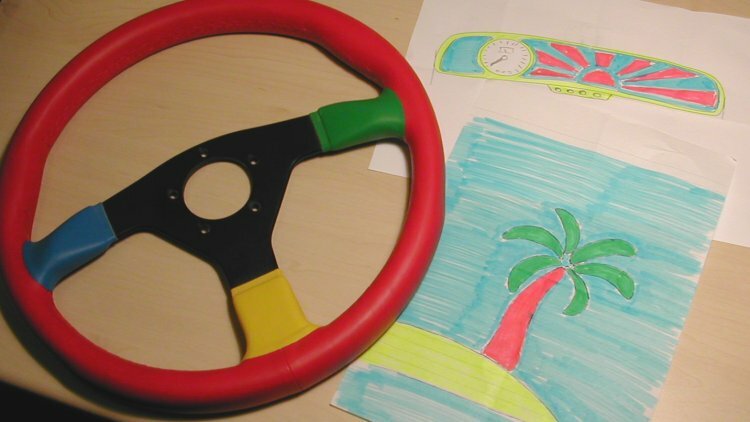 I already had the steering wheel "United colors of Benneton" and that will be the theme throughout the car. With AutoCad I made the design of the panels. 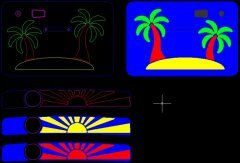 Can't decide between a rising sun (yellow) or a sun going down (red). I made a change to the design. 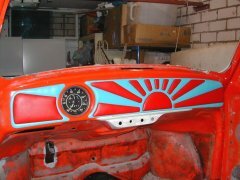 The sun ray goes to the left panel now. On the picture you can see that I have cut out all the parts of the design. I will put a thin layer of foam on the door panel (I will make a new one) with on top a blue fabric. Then the small parts will have little nuts fitted to them. Small parts will also be covered with fabric. When the parts are fixed to the door panel they will sink into the foam. The dash panel will be made the same way. 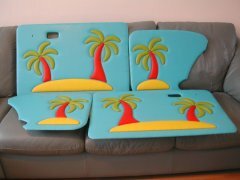 I first made new back panels. 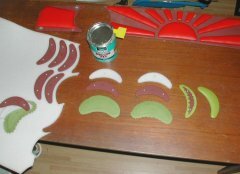 Then cut out all the pieces. I used 6 mm ply for the shapes and 4 mm hard board for the back panels. Then painted the lot for moist protection. 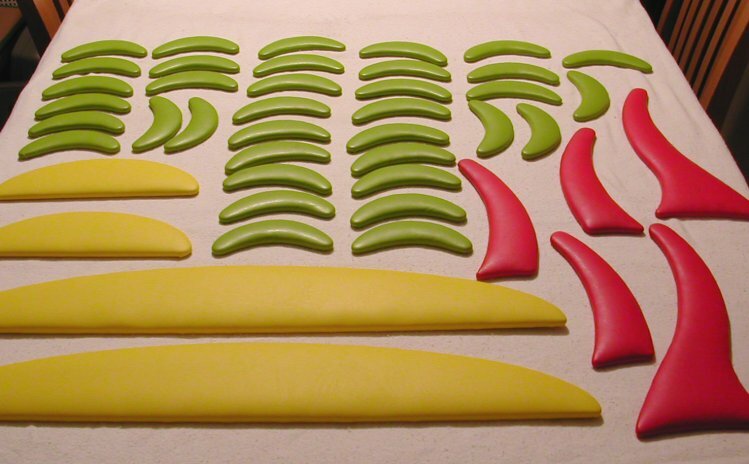 I cut out a piece of foam (6 mm) the same size as the shapes. Cut the vinyl with an extra lip of 12.5mm around the shape. Coated the vinyl lip and the back of the wood shape with contact glue. Waited 10 minutes and stuck the vinyl to the wooden shape. 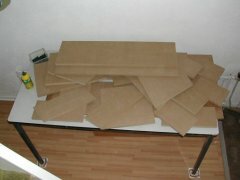 In total I made 57 shapes for the panels. On the picture the end result. 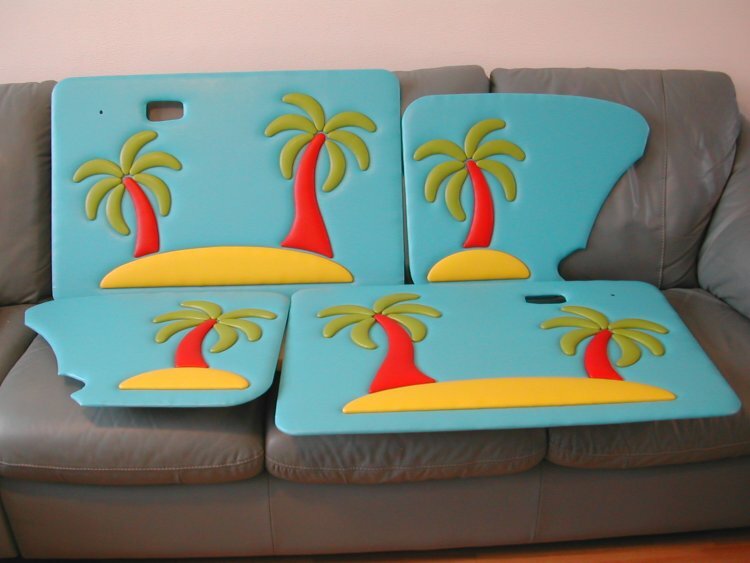 The palm tree on the back-panel is set to one side because the "boom box" will stand partly in front of these panels. Also the dashboard will be the same way. So where ever I drive to it will always be a "Run to the Sun". All switches are moved to the location of the ash tray. A piece of music is always nice. The sound system in my baja is going to be different to my daily driver. 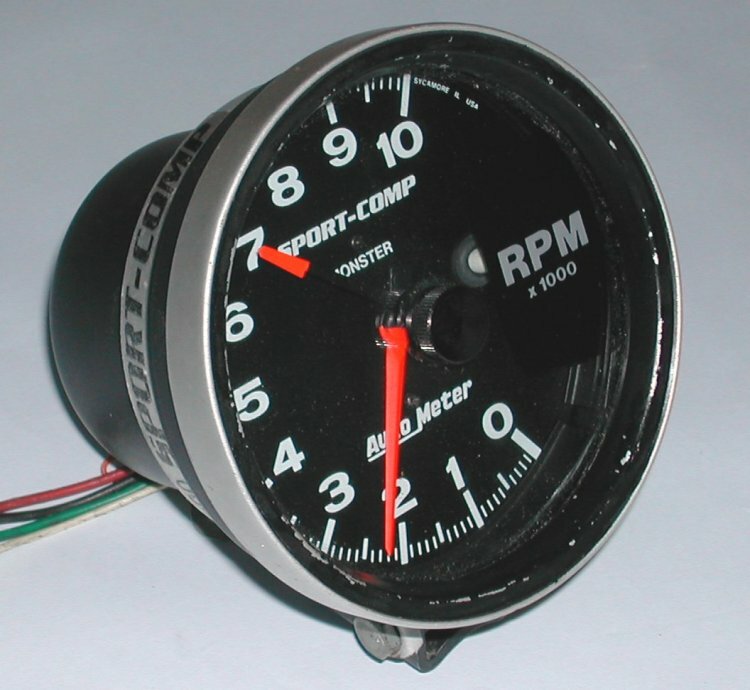 I will install a mp3 player near the shifter. 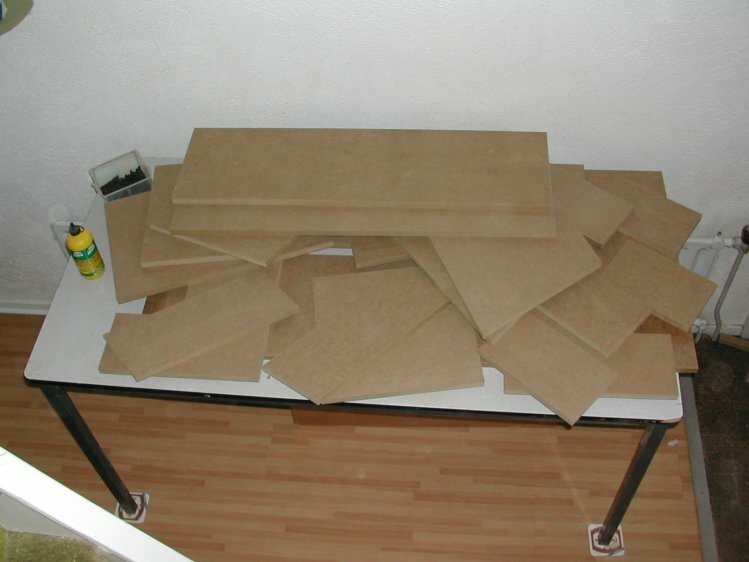 The used materials are 18mm MDF for the panels, screws and construction glue. 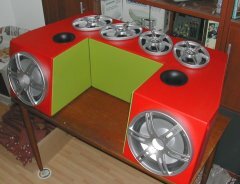 The panels are covered with red and green vinyl. 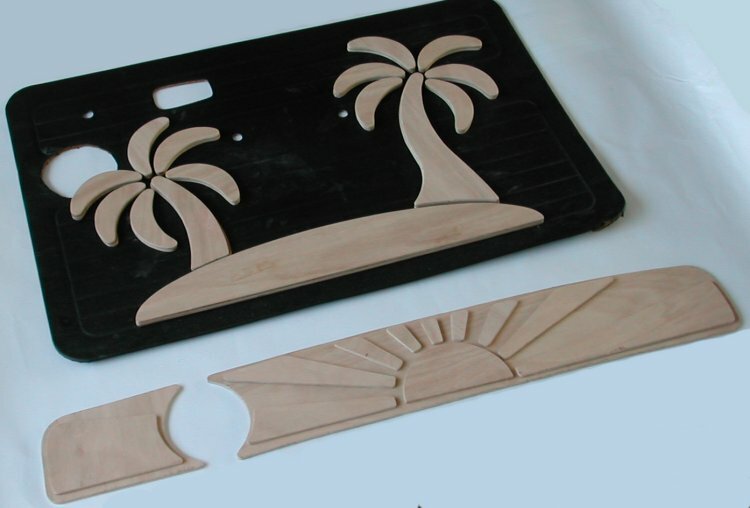 After cutting the pieces I used a router to make them exact. 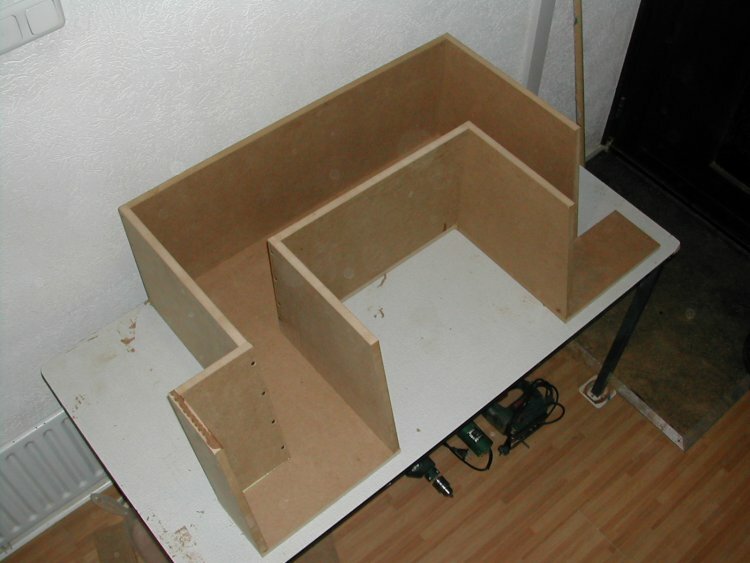 Then I build the box with construction glue and screws. Almost ready, painted everything to protect against moist. 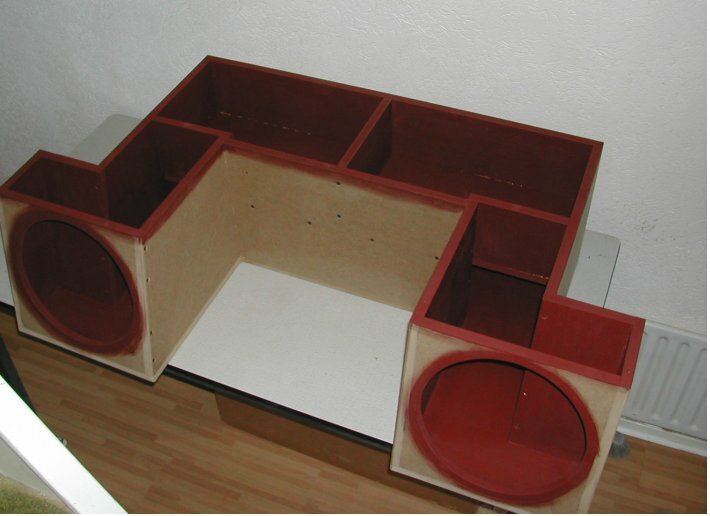 The woofer space will be filled with damping material. 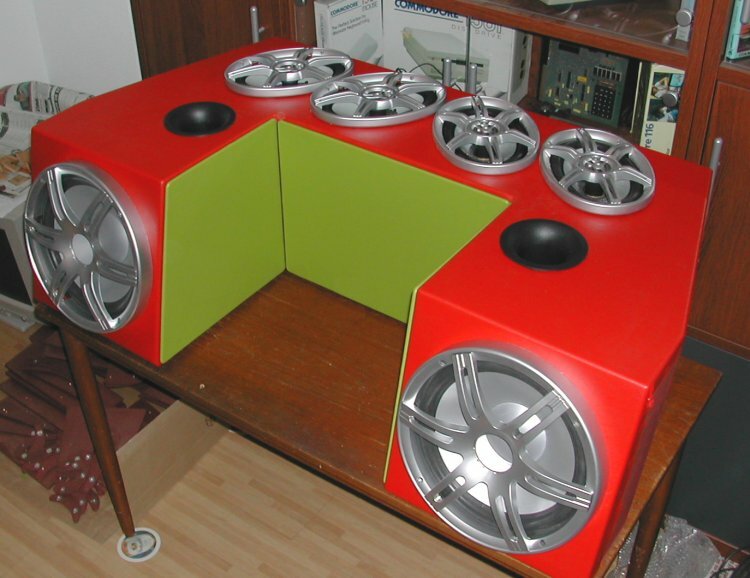 The mid and high range speakers will have their own separated space. The inside of a beetle is not that big and I don't want to use the door panels to install the speakers. I have chosen to install just one seat in the back and surround it with speakers. The end result you can see here on the picture. The box will be placed in the back above the transmission. Always wanted a Monster Tach. It arrived from the USA. Diameter is 127 mm (5 inch). It going to be mounted under the dash. Below the ash tray. 10.000 revs is a bit high but it looks great.